Car Photo of the Day: Emblematic. I thought about calling this post “Still life with Jesus-easting snake” but thought better of it. 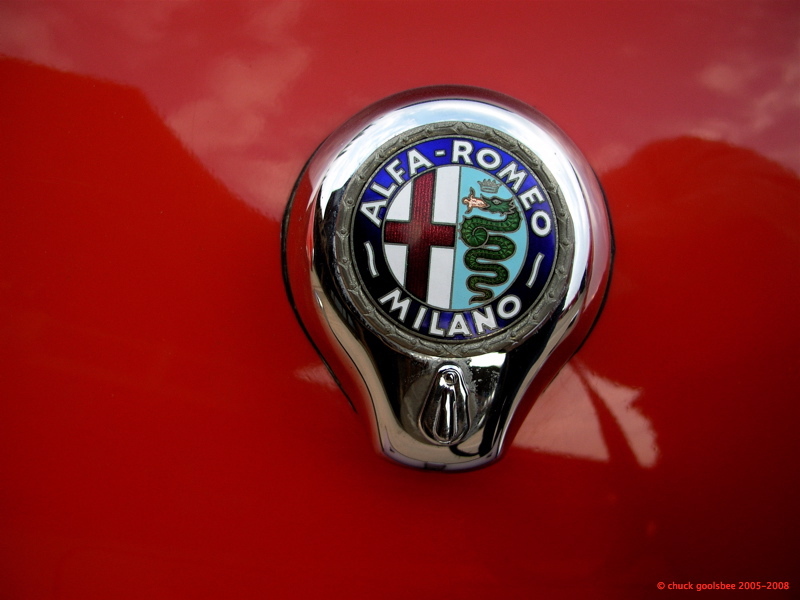 This is a photo of the emblem on Alan Chockie’s 1958 Alfa Romeo Giulietta Spider. As I photographed it at a rally rest stop a notable Alfa Romeo expert wandered by and commented that these emblems have always confounded him. Not their imagery but their construction! Made of flimsy pot metal, they are very hard to restore or reproduce. He said that Alan is very lucky that his is still in such great shape. It is one of those mysteries that we find in old cars. Funny why they chose to cut corners here, while spending lavishly in other areas of construction. Likely these tales have simple answers in human frailty and pettiness. Corporate infighting? Parts bin raiding? Somebody’s nephew with a contract? All I know is never attribute to malice that which can be explained by incompetence. I still want an Alfa though. Well, Chuck, check out craigslist: one can usually find good Spyders for 3 to 5 grand, in pretty decent shape. Fun car to drive, if a bit….slooooow. Yes, Alan tells me how he loses time on every uphill and has to regain it on every downhill of the rallies we run. While in the E-type I can just barely press the loud pedal and go up any hill at any speed I need. Grace, pace & space indeed. Next Next post: Car Photo of the Day: Rain.